WinaDay Casino has gone Mobile! Discussion in 'Mobile Casinos' started by Kotsy, Jun 7, 2014. One of the friendliest Casinos out there has just stepped up their game for everyone! 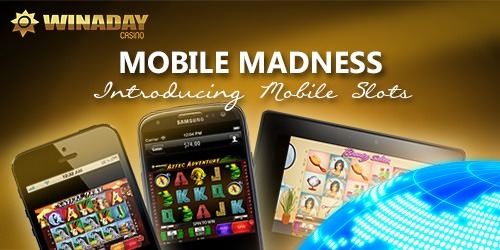 WinaDay Casino has now catapulted themselves into the Mobile realm of online playing. Win A Day Casino is in the midst of celebrating their 6th year anniversary being online and they surely are bringing the presents. This online Casino has some of the best video slots and is quite friendly to the USA player. while you're on the go. Playing the Penny Slot online video games at Win A Day Casino really can stretch your bankroll and you can capture some nice wins. There are currently 11 Penny Slots available for you to play on your Mobile Device. Supported Mobile devices are iOS versions of 6 or later and Android devices. They include iPad, iPhone, Android phones and more. One of my favorite Penny Slots is Sands of Time. I tend to get the bonus rounds frequently and really stretch my bankroll for some substantial time of playing. A little bit of something with various paylines. Each slot has their unique qualities to them. It's worth it to become a customer of Win A Day Casino and enjoy some incredible play time along with the no hassle cashout. I can't wait for more Online Video Slots to be available to play on my Mobile Device. I'm surprised it took Win A Day this long. But then again, I am not as they look for perfection as to what they offer their players. If you don't have an account at Win A Day Casino, then now is the time to sign up to get in on all of their great promotions. Finally Winaday Casino is also available for people who like to play casino games via their mobile device!